Florida has thousands of auto accidents every year, with some being attributable to weather, to poorly maintained roads, or simply to bad luck. However, a large proportion of these crashes is caused at least in part by poor driving, most notably either driving distracted or driving too aggressively. If you have been injured in an auto accident and you suspect either pattern to have played a role, it is a good idea to know the signs before moving ahead with a lawsuit. 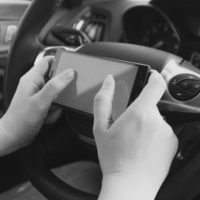 Generally, Florida’s numbers for distracted driving are not good; a 2017 study ranked the state second worst in the nation, with only Louisiana ranking higher for distracted driving incidents, and data from the Florida Department of Highway Safety & Motor Vehicles (FDHSMV) shows almost 50,000 crashes in 2016 which involved distracted driving, which caused over 3,700 casualties. These data points may even be higher, given the instances when cellphone use may go unreported to law enforcement. While none of this is acceptable, it does mean that Florida drivers would do well to be aware of the potential for problems on the highway. Be advised that Florida is one of five states in which texting while driving is a secondary offense, meaning that it cannot be the only reason that a person is pulled over. However, if law enforcement observes a driver operating their vehicle in a dangerous manner, which can happen when one is distracted, that can be a primary ground for a traffic stop. For example, if someone is weaving in and out of lanes, or if a police officer observes them driving while doing makeup or another activity clearly not meant to be performed at the wheel, they may be able to pull the person over. While distracted driving has a serious casualty count, aggressive driving is arguably even more dangerous, because a person can often become fixated on getting the ‘upper hand,’ rather than on driving well. Aggressive driving can come from sheer recklessness, or it can come from what is commonly called road rage – any little perceived slight, such as being cut off, may provoke a driver to become aggressive if they get angry, and such behavior can have serious consequences. National Highway Traffic Safety Administration (NHTSA) statistics show that roughly two-thirds of traffic fatalities nationwide are caused at least in part by aggressive driving. Florida law holds that if a driver is committing at least two of the six named actions under the relevant statute – speeding, improper or unsafe lane changes, improper passing, failure to yield, following too closely, and violating traffic control devices (crosswalk signals and others) and/or traffic lights – they are guilty of aggressive driving. The punishment for ‘aggressive careless driving’ can be anything from a monetary fine to jail time, depending on the nature of the specific incident, but even if someone does wind up facing criminal penalties, they may also still be able to be sued in civil court. Car accidents are so common that it can feel overwhelming or even fruitless to try and sue the driver who hit you. However, aggressive and distracted driving are also common, and these behaviors deserve to be called out as negligent. If you need help bringing suit, or you simply have questions, calling a knowledgeable personal injury lawyer can be a good idea. The Tampa auto accident lawyers at the Rinaldo Law Group can try to help guide you through what can be a scary process. Call us today for a free consultation.